In a stable but conservative Kurdistan in northern Iraq, Julia Lindau finds a cafe providing a rare socialising haven. A patron is leaning against a turquoise-painted divide, lazily strumming his guitar. On the opposite side of the wall, under a low-hanging tree, one young photographer shows her work to another. She has laid out the photos on a massive wooden slab, the standard table in Cafe 11's intimate courtyard. Zoom out a bit and this scene contrasts sharply with the otherwise dusty monochrome streets in the Iraqi Kurdish city of Sulimani. Nestled on the border with Iran, Sulimani was largely spared the post-2003 violence that mired the country. Its stability, combined with its oil reserves, has drawn a large amount of foreign investment in recent years. But rapid development and increasing interaction with the outside world, coupled with the popular conception of it as more liberal than its Arab counterpart, obscures the fact that Iraqi Kurdish society is deeply conservative. Female genital mutilation (FGM) and honour killings, two devastatingly traditional practices that are slowly waning in other parts of the world, have yet to abate here. A 2010 study found that a shocking 72.7% of females Iraqi Kurds living in Kurdistan still undergo FGM, for instance. The cafe therefore provides a respite from the sometimes repressive daily life in northern Iraq. 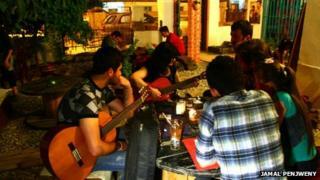 "I can't go anywhere else and just relax with my friends and act myself," one Kurdish guitar teacher laments. This includes home, since young adults are expected to live with their parents until marriage. "[Cafe 11] is a place where both males and females can go and this point is very important to Iraqi society. Men and women cannot go together to have even tea in most public places," another frequent patron, an Iraqi journalist, comments. Indeed, patrons contend that the cafe — the "11" references the building's street address — is the only haven in Kurdistan with such an open atmosphere. Here men and women interact freely, artists meet to collaborate and exchange ideas, and people learn the latest uncensored news. Equally significant, it is one of the few galleries in the area. Photographs and paintings by local artists line the brightly painted interior. Documentaries are screened in a back room. A local band recently performed, playing on in spite of a power outage, encouraged by applause from the packed courtyard. Even the building itself, which was a late Kurdish writer's flat, is a shady and antique work of art. "Cafe 11 reminds me of cafes I visited in Beirut," says one vagabond freelance writer whose office is the archetypal intellectual cafe while another visitor, a woman from Baghdad, insists that it was the first art cafe in the entire country. Regardless, the freedom with which people express themselves here means that Cafe 11 pushes the bounds of what is socially appropriate for many in Iraqi Kurdistan, let alone Iraq more broadly. So far, the edgy originality has translated into success. In the brief three-month window since its inception, the cafe has already become an institution for certain crowds such as photographers, writers, journalists, expats, intellectuals, and activists. This popularity is no accident. Jamal Penjweny, a photographer, filmmaker and Sulimani native who has worked and lived abroad, spent the last year crafting this space. "I have travelled a lot throughout the world, and always I was thinking that something was missing in my home city. I told myself I should do something to change this even if it is not 'my job'," he explains. Mr Penjweny's graceful touch, balancing aesthetically stunning presentation and powerful social commentary, is ubiquitous throughout Cafe 11. One of his series on display, "Iraq is Flying", depicts Iraqis affected by war, from ancient amputees to clean-cut soldiers, jumping into the air. These photos decorate sunrooms where patrons sip exotic fruit juices. The art housed here, especially founder Jamal Penjweny's, reflects the impact that war has had on this country. Cafe 11 inevitably though draws objections as well as praise. One elderly Sulimani native scoffs as he learns the cafe serves women and men. "I think the building used to be a Kurdish restaurant, a traditional… a very nice restaurant," he replies, furrowing his brow and casting his gaze downwards. But Mr Penjweny focuses on the positive, which is plentiful. He is smugly but appropriately satisfied with Cafe 11, and is confident that his vision will further permeate the culture of Sulimani in the future. "I am sure… in the next few years you will see a lot of cafes like this," he assures me. "For sure, it's like a revolution".